MUMBAI: The government has been repeatedly brushing aside criticism that India is growing without creating jobs. Now, it has the backing of some top economists who say that just because there is no data to prove job growth it doesn’t mean India is not creating jobs. “If we had a decade of near jobless or jobless growth my guess is that we would have seen blood on the streets,” Jahangir Aziz, head of emerging market research at JPMorgan, said on Thursday. “The fact that we haven’t seen blood on the streets, from that I will conclude that jobs have been created,” he said at the 4th SBI Banking and Economics Conclave in Mumbai. Several studies show that there has been a continuous decline in employment elasticity in India. 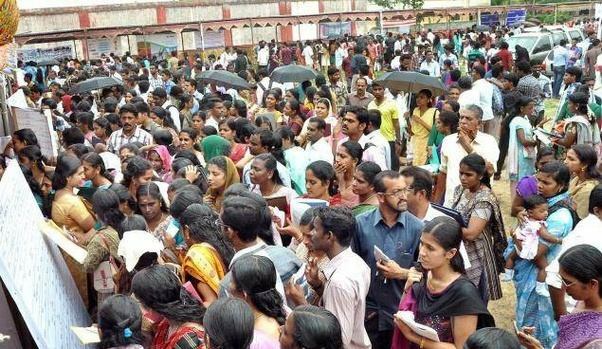 Government data shows that employment elasticity in India in the last decade declined from 0.44% to 0.01%, which means that there was no job creation possibly between 2004 and 2010. This is despite the fact that India’s average GDP growth rate was more than 7% in the last decade. The government in the recent times has argued that the job creation was not been counted properly and was exacerbated because of no credible surveys of unemployment of recent vintage. Arvind Panagariya, vice chairman at official think tank NITI Aayog, recently termed the claim of ‘jobless growth’ as “bogus”. As per liberal estimates, unemployment rate in the country is 2-3% while conservative estimates would put it at 5-8%. Several economists still believe that the government needs to work towards generating employment in the agriculture sector. “We have to worry about the agriculture sector because it provides more than half of the labour force with employment and livelihood,” said Indira Rajaraman, member of the 13th Finance Commission. “Policy towards the agriculture sector in India has been incredibly perverse. We are having farm unrest on the back of a bountiful harvest. So in a year when the harvest was good you had a downward income shock and in a year like last year when there was a bad drought again you had a downward income shock, this tells us that something is terribly wrong,” she said.